Diabetic patients are at a greater risk for developing periodontal disease, leading to increased blood sugar levels and various diabetic complications. Since diabetic patients are more susceptible to infections, periodontal disease occurs in this population at a much higher rate. Periodontal disease is considered to be a complication of diabetes and patients with uncontrolled diabetes are at a higher risk of developing gum disease. Research suggests that diabetic patients may have difficulty controlling their blood sugar levels. 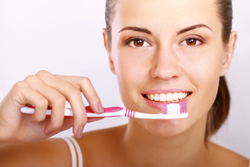 Those with diabetes and periodontal disease may also have trouble with the maintenance of their oral health. In addition, patients with severe periodontal disease may experience increased blood sugar levels, increasing the duration when the body functions with an extremely high amount of blood sugar. Diabetic patients with severe periodontal disease are at an increased risk for developing diabetic complications. Contact our periodontist in Los Angeles for more information on how gum disease affects diabetes.